Malaysia is like food hub, we can easily find many types of cuisines and some eateries operate round the clock. However, we often face difficulties when searching for interesting eateries to visit, and as always, it comes down to that ultimate question What and Where To Eat? Fret not, now we go a solution for you and your makan kakis. I just downloaded Ho Chak! 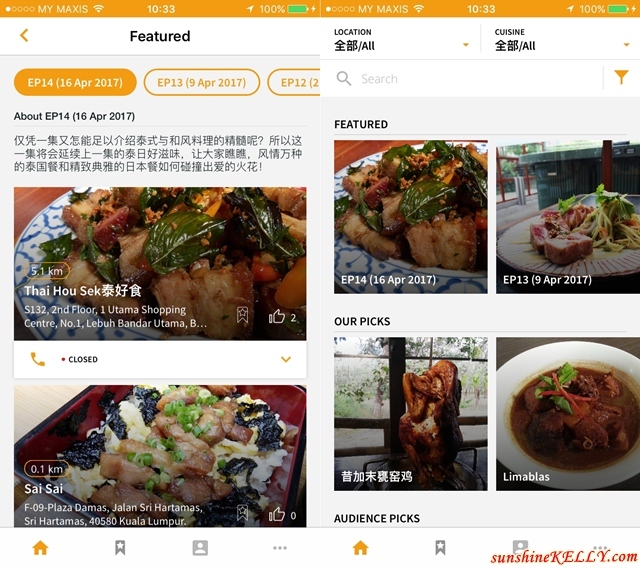 app on my mobile, the app that connects us to delicious & interesting food places in Malaysia. Let me take you to eat Ho Chak! food. In the nutshell, Ho Chak! 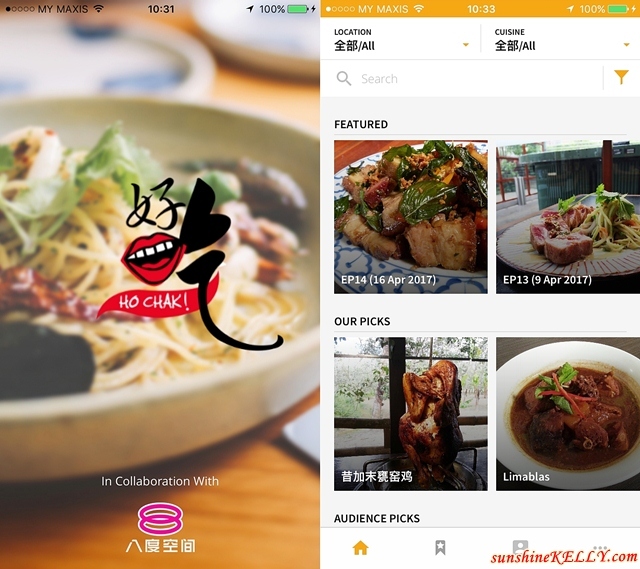 is the latest mobile app by Media Labs that curates restaurants and eateries around Malaysia. Start satisfy your tastebud and embark on a food adventure with a selection of mouth-watering cuisines that are available on the app. Recommended dishes in each restaurant and eatery; plus restaurants or eateries pick by Ho Chak! and audiences also available for you convenience. There is 2 languages available in this app, you can select English or Mandarin at the 'More Action' tab. Search for << Ho Chak! >> and download it! Ho Chak! app is now available to download for free on Apple Store and Google Play. Search for << Ho Chak! >> and download it. You can check out my InstaVideo below how seamlessly and easy using Ho Chak! app to search for food. I am sure some of you follow Ho Chak! show on TV but sometimes we missed out the details and locations when it’s on air. Now with Ho Chak! app on my mobile all the details are in my hand. We can now explore places that are featured on the Ho Chak! TV programme on the ‘Featured’ tab. Besides that, we can also discover restaurants and eateries that are within our proximity with the ‘Nearby’ tab. If you are unable to decide where to go for an occasion for example company gathering, friends birthday or romantic dinner with your loved ones or have a limited budget? Ho Chak! 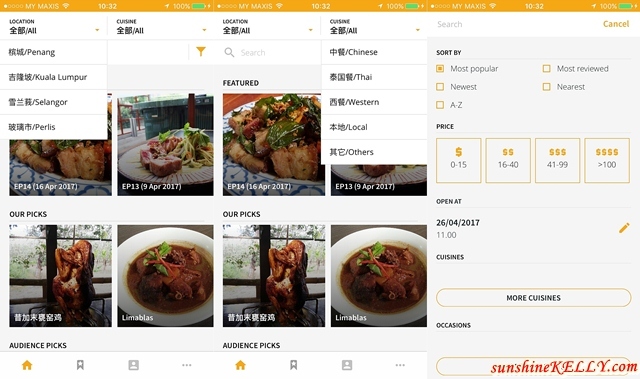 app has solution, to make things easier you can filter restaurants by location, cuisine, price, and even occasions. The next time when you are planning for event or occasion do remember to check out Ho Chak! app first. Wow! there are so many types of cuisine available such as Chinese, Thai, Western, Local, French, Japanese, Taiwanese, Nyonya, Malay, Italian, Indonesian, Korean, Vegetarian, Sawarak and Fusion. Food is always brings people together. Once we have selected the eateries, at the restaurant page we will be able to find all the necessary details and a brief description about the eateries or restaurant. Information such as type of food served, operating hours, contact, price range, location, directions to get there, photos, videos, facebook, website and users comments. At the same time, we can also contribute our photos, videos and leave comments or reviews on the restaurant page. Then share it on our social media platform as well. There are so many interesting, unique and delicious food places to be discovered and explored. So download Ho Chak! app and start to unleash your inner gourmet. Ho Chak! app is now available to download for free on Apple Store and Google Play Search for << Ho Chak! >> and download it! This is a good invention for foodies. It will be great if they have like a Halal sign on the shop that Muslims can eat. I'm gonna download this shortly just to see what eateries in Ipoh are listed. I hope there is a version that does not have Chinese at all. Banana here. i used to be one of the fan of this Ho chak show. happy to know that there is ho chak apps nowadays. it definitely useful to all food hunters out there to decide where and what to eat. Food looks delicious. I want to download the App too to find Ho Chiak recommended food. om nom nom. Looks like an app for foodies! Time to install this to my phone. I have watched Ho Chak for nearly 2 years and I still follow their show in hunting for nice food. will install their app to get more inspiration when come to food. This is very helpful not only for foodie but for also like me who needs faster searching. Thumbs up! Wow lucky you when you get take photo with a handsome Ho Chak guy! I want! My family and I enjoyed to watch Ho Chak TV! Wow.I wan take a photo with a handsome Ho Chak!, Gary. Lucky you! My family and I enjoyed to watch this programme TV! Examine xnspy app that would be a nice and helpful app for every parent.